No matter what time of year you're planning to travel to the Mediterranean country of Greece, you're sure to find unique celebrations, plenty of outdoor activities, and some great tourist destinations to visit. However, it's important to know what to expect when it comes to the weather so that you're able to pack for your Greek vacation. Greece has a typical Mediterranean climate, which lends itself to mild and often wet winters and dry summers. The country is mostly sunny throughout the year. The northern part of the country can be very cold during the winters, even receiving snow in some areas. Winter is milder to the south. July and August are the busiest months, but they also have the most frequent transit schedules to more remote Greek islands and perfect weather for outdoor adventures and day trips. If you plan to explore the many natural wonders of Greece or want to enjoy an outdoor Athens tour, schedule your trip from April to October, but if you want to swim, temperatures are warm enough from mid-May through September. While Greek tourism officials fight against the concept that there is ever an "off-season" in Greece, tourism tumbles from November through March. Expect low prices, but many island and coastal resorts will be closed, and transit schedules will also be at a minimum, making it harder to get around quickly. Whether you're visiting one of the northern ski resorts in the winter or heading to a pristine Greek beach in the summer, knowing what to pack ultimately boils down to knowing what the weather will be during your trip. Athens has a Mediterranean climate with hot and dry summers and sometimes cold and wet winters. Temperatures average 84 degrees Fahrenheit (29 degrees Celsius) in August but can exceed 100 degrees Fahrenheit (38 degrees Celsius). It is the hottest capital city in Europe. 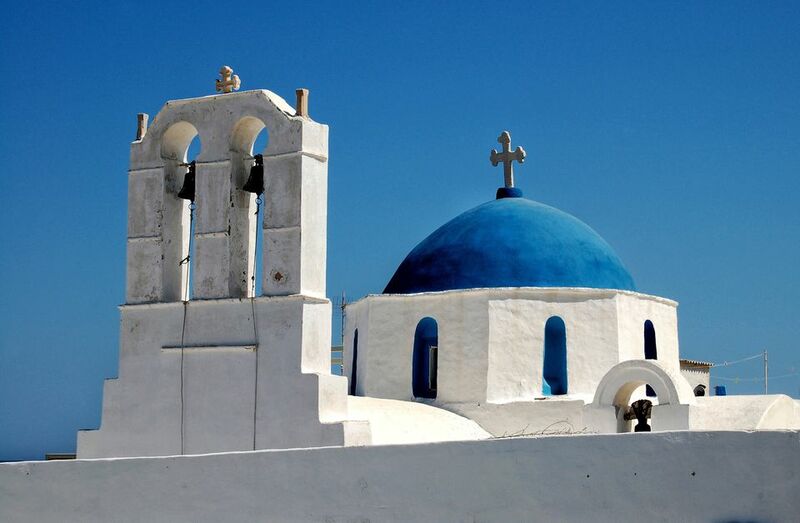 Santorini, the largest island of the Cyclades, has a semi-arid climate with warm weather from May through September. It's also extremely dry; you can expect very little rainfall during the summer months. Winters are cool, but not freezing—temperatures average around 55 degrees Fahrenheit (13 degrees Celsius). Like much of Greece, Thessaloniki has a Mediterranean climate, but it experiences much greater temperature variations than other parts of the country, with winter temperatures occasionally dropping as low as 15 degrees Fahrenheit (-9 degrees Celsius) and snow falling on the northern plains. The city receives almost 300 days of sunshine per year. Corfu, an island in the Ionian Sea, is still warm and dry during the summer but receives much more precipitation during the winter months than Santorini and other popular islands. Because of this, Corfu is covered with much more lush vegetation than other parts of Greece. Winters can be cloudy and sometimes gloomy, but never incredibly cold. Crete is Greece's largest island and has a Mediterranean climate. Winters are mild and often wet, and summers are sunny with very little rainfall. Most of the island's rain occurs during the winter months, from October through March. If you're planning a Greek holiday vacation, December is the month to do it. Although winter has already set in, temperatures stay relatively warm in the coastal cities. If you're a fan of winter sports, visiting Greece in January is the height of ski season; however, after a brisk start with New Year's Day and Epiphany, the rest of January is relatively quiet in terms of events. In some years, Carnival season begins in February, which can liven up the month considerably. What to pack: Pack a warm coat and clothing that can be layered to avoid getting too hot or too cold in January, Greece's coldest month. February gets progressively warmer, but you'll still need to bring sweaters, undershirts, and a light jacket if you plan to be outdoors. You also might need a heavier jacket if you're planning to catch the last of the ski season, but pack layers of clothing if you want to take advantage of the last of the winter sale prices at local indoor shops. Early spring rains in March bring wildflowers as the weather begins to really warm up. In April, the weather improves throughout Greece, while prices stay low. It may be too chilly for all but the most ardent swimmers, though. Since most schools around the world are still in session during this month, May offers an inexpensive and crowd-free experience during one of the best weather months of the year. What to pack: Temperatures are gradually warming up during the spring, but light layers are still recommended for the cooler nights. Combining the best of spring with warmer summer temperatures and still a bargain, June is the ending of the spring bargain "shoulder" season, meaning it's your last chance to catch some great deals on a cheaper vacation. Also the name of a favorite movie shot in Greece, the "high season" consists of the months of July and August and features the highest prices, best travel schedules, biggest crowds, and sweltering temperatures. July is one of the warmest months of the year and one of the most expensive at the shops; August is another hot, busy month in Greece, and the August 15th Festival of Mary and Feast of the Assumption often confuses travel schedules for the days preceding and immediately following the feast, so plan for extra travel time on your trip during mid-August. What to pack: Remember to pack a bathing suit and lighter clothing because summer in Greece gets quite warm, especially if you're visiting during the peak months of July and August. September is a great month for the budget-minded, independent traveler because it's the beginning of another shoulder season in the country. Warm weather lingers most years into the first half of October while shop and tourist attraction prices slowly begin their decline into the shoulder season of late fall. November brings cool, mostly clear weather. What to pack: Fall is warm, making it a great time to visit. Pack similarly to summer, bringing lighter clothing, a swimsuit, and good sunscreen. If you visit later in the season, a sweater will be useful for increasingly chilly nights.